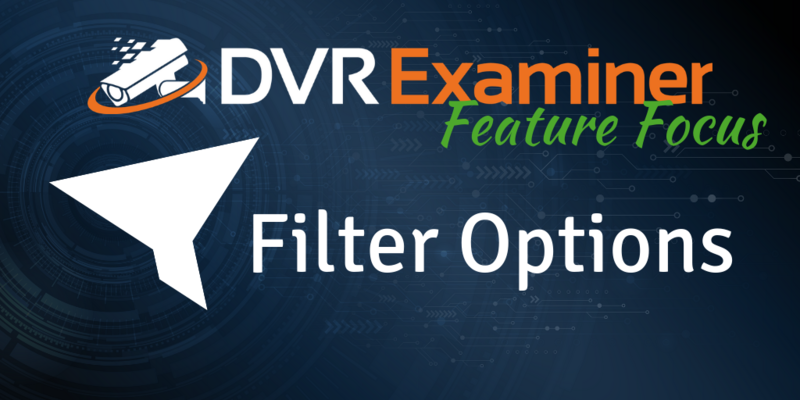 Feature Focus: Filter Options in DVR Examiner - DME Forensics Inc. The first filter options are located in the sidebar of the clip list and can be used to filter out selected video clips. The “Update Filter To This Channel” and “Update Filter To This Time Range” buttons will take the corresponding data for any clips currently selected in the clip list grid and update your main filter to match that data. For example, imagine you have a 16-channel DVR with all 16 channels showing up in the clip list grid. If you select a clip within the grid from channel 8, then press the “Update Filter To This Channel” button in the sidebar DVR Examiner will automatically update the clip list to filter only video clips from channel 8. If you have multiple clips selected when clicking this button, such as channel 8, 11, and 16, this clip list grid will automatically filter only for channels 8, 11, and 16. The “Update Filter To This Time Range” button works in the same way. When you click this button, the clip list grid will update to only show clips that fall between the earliest start time and the latest end time of the clips selected. DVR Examiner also has several options in the top “View” tab to quickly update the clip list. Within the “Clip List” section of this top bar, you’ll see three options: “All”, “Matching Filters”, and “Marked For Export”. These options will update your clip list to show the clips that match your request (all available, clips that match your filters, or only clips marked for export). This feature provides an easy way for you to jump between different views of the clip list as you review video. For example, if you are reviewing clips within a specific time range, you can easily jump between the list of filtered clips and the clips marked for export with these buttons. To see this filtering process in action, sign up for our next free “Getting Started with DVR Examiner” webinar.